This weekend the third edition of the Sydney derby will be played in front of a full house at Parramatta Stadium. With Western Sydney looking to win the minor premiership and Sydney FC eying off a finals spot, there is plenty to play for. Aside from the grand final, the derby is shaping up as the game of the season. It’s appropriate that it will involve both Sydney clubs. For decades there has been a simmering frustration in other states about the media’s so-called obsession with Sydney. In Melbourne especially, fans have alleged that the press gallery are biased towards Sydney clubs to the detriment of a rich football culture in Victoria. It’s a fair point. However, in the days of the NSL, Sydney was the engine that drove football, both on and off the field. The game’s administration was centred around the Harbour City, and Sydney clubs dominated on the field. In the A-League, however, it has been hard to make the same case. One-team, one-city meant that the success of Melbourne Victory and Brisbane Roar took much of the attention away from Sydney FC, who struggled to truly cement their identity due to constant off-field turmoil. The fact that Melbourne Heart came into the competition before a second Sydney side only reinforced the importance of Melbourne to the overall success of the A-League. This season, however, the city of Sydney has well and truly risen to the challenge. Indeed, both Sydney clubs have been integral to the current buzz surrounding the competition. The introduction and instant success of the Wanderers has been just one part of this turnaround. However, it is important to remember that before the Wanderers went on their unprecedented winning streak, it was Sydney FC’s audacious marquee signing that really put the spotlight on the A-League. Soon after, Newcastle and Western Sydney scrambled for their own marquee signings to match the benchmark set by Sydney FC. The Del Piero domino effect cut Lyall Gorman’s “no-marquee player” strategy to ribbons. He quickly went from talking down the marquee concept to having discussions with Michael Ballack and Shinji Ono. Indeed, both Ono and Emile Heskey admitted that their interest in coming to the A-League was piqued by Del Piero’s presence. Sydney FC’s two million dollar gamble changed the nature of the league in an instant. And despite the Sky Blues inconsistent form, Season Eight will likely be remembered as the season of Sydney. Can you imagine this A-League season without Del Piero? Or worse still, if the Wanderers had been just average? This is not to take anything away from Adelaide, Perth, Brisbane, Wellington, Central Coast and Newcastle. Indeed, one-team one-city and strong regional centres mean that these clubs are, and always will be, an integral part of the football family. However, for football to truly take off, the two major cities are crucial. You get the sense that the A-League now has the proper foundations to continue it’s rise. Further expansion is now a case of when, rather than if. In the run up to Saturday, these moments will only add to the drama of the occasion. For the fans of the Wanderers, there will be nothing sweeter than lifting the Premier’s Plate in front of their cross-town opponents. It may be just the sort of moment that turns a derby into a heated rivalry. It’s been a dream season for football fans right around the country. 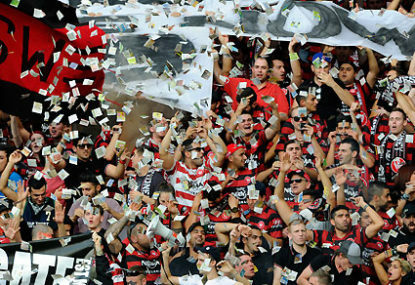 As the nation’s attention turns to Parramatta Stadium, it’s a good time to pay tribute to the active supporter groups the RBB and The Cove, and to the efforts of Lyall Gorman and Tony Pignata.